Look into another possible plot against the king involving the former King Llethan's widow. Speak with Tienius Delitian in the Royal Palace Throne Room. Find a handwritten note on the desk. Find and kill Forven Berano. Find and kill Hloggar the Bloody. Find and kill Bedal Alen. Return to Tienius for your reward. Speak with Tienius Delitian in the Royal Palace Throne Room again and agree to help him investigate a possible plot against King Helseth. You are to search the Llethan Manor in Godsreach for any possible documents that might provide evidence of such a conspiracy. Tienius warns that the widow of the dead king, Ravani Llethan, lives there and has a good number of guards, and he suggests you go there under the cover of offering your condolences to her. The Llethan Manor is in the northwest corner of the Godsreach District in Mournhold. Ravani is on the ground floor if you wish to speak with her, though no one will bother you anyways. Although there are large safe areas where no one will witness your search, the document needed for this quest is a handwritten letter lying on the desk in the same room as Ravani. Use chameleon/sneak or whatever you need to get away with taking the letter. If you are caught stealing, she and the other people in the building will attack. Return the handwritten letter to Tienius and he will offer you the opportunity to kill three people involved in the plot to kill the King: Forven Berano, Hloggar the Bloody, and Bedal Alen. He gives you writs for all three and gives you some vague suggestions on where to start. Tienius suggests to look for him around the Temple area. Indeed, Forven is wandering the grounds at the north end of the Temple. If you confront him with the "Evidence of Conspiracy," you have the option of killing him or letting him escape. Tienius suggests looking for this Nord in the sewers. Speak to a High Ordinator and they'll tell you to look for him in the West Sewers. Head to the northwest corner of Godsreach and go down the trapdoor into the Residential Sewers. From there, follow the tunnels east and south a short way until you find the ladder leading to the West Sewers. Head up the ladder and turn west, following the cave tunnel as it twists and heads back to the south. You will find Hloggar just as the caves emerge into sewer tunnels. Unfortunately, Tienius has no idea where Bedal might be. Talk to a High Ordinator, however, and you might be told that he is a bookworm, so check at a bookseller. Check out the bookshop in the Great Bazaar and you'll find Bedal upstairs. Again, confront him with "Evidence of Conspiracy" and either kill him or let him escape. Once the three are dealt with, return to Tienius to receive a maximum reward of 3,000 gold, minus 1,000 for each target you let go. If you are a member of House Hlaalu, be sure that nobody witnesses you killing Bedal Alen. He is a fellow member of the House and if anybody sees you kill him you will be expelled. You can kill all three targets before the quest starts and Tienius will not object. TR08_Hlaalu_Ravani 1 and 5 cannot actually be obtained. There is no journal entry for those unlike the other three. You can still offer your condolences and swear to avenge their death but won't get a journal entry for it. If you do not use all three writs for this quest, you can use them like any other writ. Keep one of them in your inventory, and the other two in your house or stronghold. Even though they are specifically marked with the names of the three targets, if you are confronted by a guard for any crime, you can get away clean by giving them one of the writs. Your bounty will be zero, and you will keep all your stolen items. 1 Tienius Delitian has asked me to search Llethan Manor for documents, diaries or other tangible evidence of conspiracy by Hlaalu nobles. 50 I found a letter in Llethan Manor that appears to refer to a conspiracy to assassinate King Helseth. If Tienius Delitian wants tangible evidence of a conspiracy, this letter should be sufficient. 60 I gave Tienius Delitian the letter I found in Llethan Manor. He concluded that Forven Berano, Hloggar the Bloody, and Bedal Alen are conspiring to assassinate King Helseth. He will immediately draw up writs for their execution, and asked me to execute these traitors. I told him I wasn't interested. 70 I gave Tienius Delitian the letter I found in Llethan Manor. He concluded that Forven Berano, Hloggar the Bloody, and Bedal Alen are conspiring to assassinate King Helseth. He gave me Royal Writs for their execution, and asked me to execute these traitors. I agreed, and will report back to him when the three traitors are dead. 100 Finishes quest I reported to Tienius Delitian that Forven Berano, Hloggar the Bloody, and Bedal Alen had escaped. He thanked me for trying. 110 Finishes quest I reported to Tienius Delitian that Forven Berano, and Hloggar the Bloody escaped, but that I executed Bedal Alen. He thanked me for my efforts, and paid me 1000 gold. 120 Finishes quest I reported to Tienius Delitian that Bedal Alen, and Hloggar the Bloody escaped, but that I executed Forven Berano. He thanked me for my efforts, and paid me 1000 gold. 130 Finishes quest I reported to Tienius Delitian that Bedal Alen, and Forven Berano escaped, but that I executed Hloggar the Bloody. He thanked me for my efforts, and paid me 1000 gold. 140 Finishes quest I reported to Tienius Delitian that Bedal Alen escaped, but that I executed Hloggar the Bloody and Forven Berano. He thanked me for my efforts, and paid me 2000 gold. 150 Finishes quest I reported to Tienius Delitian that Hloggar the Bloody escaped, but that I executed Bedal Alen and Forven Berano. He thanked me for my efforts, and paid me 2000 gold. 160 Finishes quest I reported to Tienius Delitian that Forven Berano escaped, but that I executed Bedal Alen and Hloggar the Bloody. He thanked me for my efforts, and paid me 2000 gold. 170 Finishes quest I reported to Tienius Delitian that I had executed Forven Berano, Hloggar the Bloody, and Bedal Alen. He thanked me for my efforts, and paid me 3000 gold. 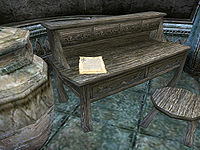 TR08_Hlaalu_A 5 Tienius Delitian has asked me to search Llethan Manor for documents, diaries or other tangible evidence of conspiracy by Hlaalu nobles. The widow of the dead king, Ravani Llethan, lives at Llethan Manor, and there may be guards. Delitian suggests I should offer my condolences to the widow, and have a look around. TR08_Hlaalu_Alen 1 I warned Bedal Alen that Tienius Delitian had evidence of his conspiracy, and that a writ for his execution had been issued. Bedal Alen thanked me, and teleported away to safety. Now I'll have to persuade Delitian that someone in the Palace must have warned Bedal Alen and enabled him to escape. TR08_Hlaalu_Alen_A 1 Bedal Alen has been slain according to the writ for honorable execution in the name of King Hlaalu Helseth. The execution was reported as a crime. 5 Bedal Alen has been slain according to the writ for honorable execution in the name of King Hlaalu Helseth. No one has reported my actions. TR08_Hlaalu_Berano 1 I warned Forven Berano that Tienius Delitian had evidence of his conspiracy, and that a writ for his execution had been issued. Forven Berano thanked me and used an Almsivi Intervention to transport himself to safety. Now I'll have to persuade Delitian that someone in the Palace must have warned Forven Berano and enabled him to escape. TR08_Hlaalu_Berano 1 Forven Berano has been slain according to the writ for honorable execution in the name of King Hlaalu Helseth. The execution was reported as a crime. 5 Forven Berano has been slain according to the writ for honorable execution in the name of King Hlaalu Helseth. No one has reported my actions. TR08_Hlaalu_Hloggar 1 I warned Hloggar the Bloody that Tienius Delitian had evidence of his conspiracy, and that a writ for his execution had been issued. Hloggar the Bloody thanked me and teleported away to safety. Now I'll have to persuade Delitian that someone in the Palace must have warned Hloggar the Bloody and enabled him to escape. TR08_Hloggar_A 1 Hloggar the Bloody has been slain according to the writ for honorable execution in the name of King Hlaalu Helseth. The execution was reported as a crime. 5 Hloggar the Bloody has been slain according to the writ for honorable execution in the name of King Hlaalu Helseth. No one has reported my actions. TR08_Hlaalu_Ravani 1 Ravani Llethan seemed grateful when I offered my condolences for the death of King Llethan. 5 When I swore to avenge King Llethan's death, Ravani Llethan blessed me, and said she would mention my name to those among her brother's friends who will not rest until justice is done. This page was last modified on 13 December 2017, at 17:24.